Under the slogan "The Malësia (Highland) Unites Us", three Albanian parties in Montenegro have come together for local elections in one of the most important municipalities in the neighbouring country, that of Tuz. 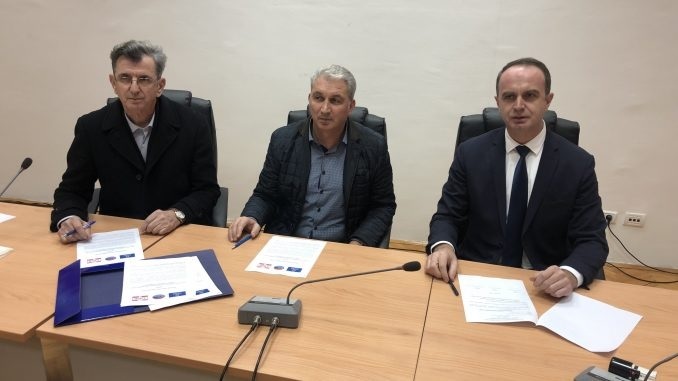 The Albanian Alternative, the Albanian Democratic League and the Albanian Democratic Union in Montenegro have successfully completed their mission to get united for the March 3 local elections. The representatives of these parties said to Montenegrin media that this will be an historic election process, which will mark a major turning point for respecting the rights of all Albanian citizens in the neighboring country. Tuzi is in fact the second municipality after Ulcinj with Albanian majority in Montenegro and the election of an Albanian mayor would be a great victory for the Albanians. The three parties will come up with a common list. Unlike the local elections in Albania, the mayor is not elected by direct vote by the citizens, but by the votes of the majority of members of the municipal assembly. "Our union was a moral and national obligation," says Nik Gjeloshaj. "We successfully fulfilled the basic requirement of Albanian citizens. We are confident that this unification, apart from the citizens, will be strongly supported by our diaspora, wherever it is. Despite the criticisms, this political class that unites Albanians today in a coalition proved to be in favor of Malesia," he said. The decision is welcomed unanimously by all political forces in Albania, especially by former Minister Ditmir Bushati, who was personally involved in talks between Albanian parties. "The constant efforts and engagement with all political actors, the National Council of Albanians in Montenegro yielded the fruits. With political accountability and civic mission, the Albanian political factor has signed the electoral coalition agreement, formalising the participation in the local elections in Tuz through a joint list..., writes Bushati on social networks. "This step, which is a long-awaited moment for Albanians in Montenegro, is the best evidence of political maturity, and at the same time constitutes another significant achievement for our dynamic and constructive foreign policy in the region," adds former Foreign Minister. After him reacted also President Ilir Meta, who considered the unification of the Albanian parties as a very wise move. "Wishing success in this electoral contest, I am confident that this agreement is a step in the right direction for the victory and direction of the Municipality of Tuzi through cooperation, but also exemplary coexistence with Montenegrins and with all the other ethnic groups," said the president. Tuzi has become a key area for the Albanians of Montenegro after the announcement as a full-fledged municipality in April 2017. Tuzi was once part of the Podgorica capital's administrative unit and as such has always been lead by Montenegrins.